I make all of these with goat's milk soap. These bars sell fast, so I am usually taking orders, and making them to specific requests. No two seem to come out alike as I dust the coloring on by hand. Here are some examples of how I can customize the soap for you. You can request essential oils and fragrances, color dusting preferences, and color of goat's milk soap base. 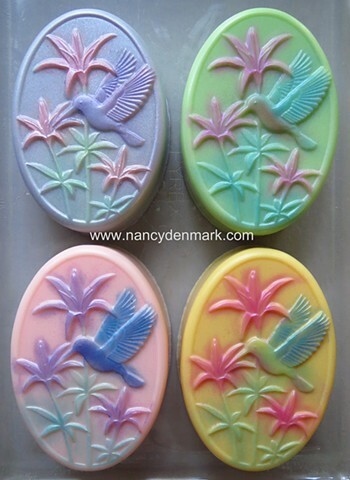 Since I am adding color to a white soap base, all colors come out in pastel shades. I can add botanicals to the base, like ground lavender buds, chamomile, or oatmeal. Over time, botanicals can bleed brown into the soap. I can create a top layer of plain goat's milk and add the botanicals to a bottom layer to keep the browning from discoloring the top design. Just send me your requests. These are large bars and usually price out between $9 - $10 each. At this time of posting, I have the pink melon and green pear bars in inventory.